Here you will find a wide range around the topic of Drums & Percussion, many drum items from renowned manufacturers and their drummer accessories. We are a young company, but already now we intend to expand our services continuously in order to offer our customers gradually even more choice and mainly items in different price and quality classes. So that everyone finds what he is looking for, whether beginner, amateur, semi-professional drummer to professional ... and this for a nice price. 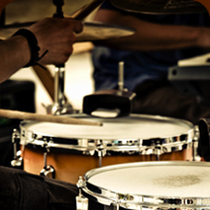 Music is for us an absolute passion and so we understand our service to all of the drum enthusiasts. We're working on it to promote enthusiasm for music and to let your enthusiasm with our drums and percussion instruments spill on your audience. Have fun exploring our new webshop.